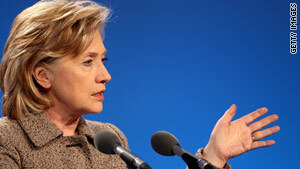 Secretary of State Hillary Clinton is seeking international support for imposing U.N. sanctions on Iran. Washington (CNN) -- The Senate passed a bill on Thursday that would allow President Obama to expand sanctions against Iran to pressure the Islamic republic to drop its nuclear weapons ambitions. The House passed its own expanded sanctions bill last year. To become law, the two versions would have to be merged and the final version approved by both chambers before going to Obama for his signature. Under the Senate measure that passed on a voice vote, Obama could impose new U.S. sanctions that would target Iran's gasoline imports and oil refining capacity, as well as other aspects of Iran's oil industry. It also would ban most direct imports and exports between Iran and the United States, along with other steps aimed at preventing business ties with some Iranian companies and individuals. "I believe that passing this legislation is critical to send Iran the message that the United States is serious about keeping Iran from acquiring nuclear weapons capability," Senate Majority Leader Harry Reid said in a statement. Iran says its nuclear program is for peaceful purposes, but the United States and other Western nations fear Iran wants to develop nuclear weapons. Israel has called Iran's nuclear program the major threat facing its nation. The American Israel Public Affairs Committee, a pro-Israel lobby group, lauded the Senate's approval of a sanctions bill, saying Congress should pass a final version as soon as possible. "Iran's possession of nuclear weapons capability would be a devastating blow to America's national security interests," the group said. It called on the U.S. government and its allies to "impose biting diplomatic and economic pressure to try and peaceably prevent Iran from acquiring nuclear weapons and avoid confronting more distressing alternatives." Israel has previously bombed Iraqi nuclear facilities. Iran is holding out on a United Nations-backed deal on its nuclear program that includes enriching uranium for non-weapons use. The country had until the end of 2009 to accept the deal offered by the "P5 plus one" -- permanent U.N. Security Council members Britain, China, France, Russia and the United States, plus Germany. Instead, Iran countered, giving the West until the end of January to accept its own proposal. On Thursday, Secretary of State Hillary Clinton said she was seeking international support for imposing U.N. sanctions on Iran. "We want as much support as we can possibly muster, and we want to be sure that we are aiming at the mindset of the Iranians so that they understand that the international community will not be turning a blind eye to their continuing violations of Security Council obligations of International Atomic Energy Agency regulations," Clinton said.